The entire Spartan army was divided into six parts, called the mora. As part of the first morae included hippocampus. So called top 300 Spartan hoplites army. They chose the men who were in their prime. They were on the right wing of the army and served as bodyguards of the king. In 480 BC during the second march the Persians against Greece (Greco-Persian War of 500-449 years. BC) the army of the Persian king Xerxes crossed the Hellespont Strait and moved into the Greek territory. In the narrow Thermopylae pass between the mountains and the sea the Persians stopped the king of Sparta, Leonid with a force of 300 Spartans and 7000 warriors the allied Greek cities. Leonid foresaw the possibility of encirclement, and sent most of the allies in a safe place. 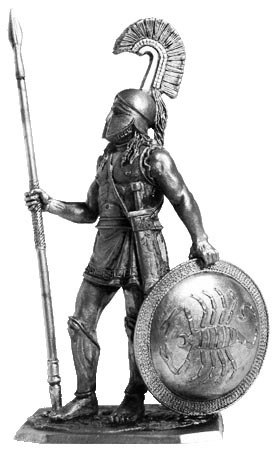 Himself with the 300 Spartans took the fight with a detachment of ten thousandth of the "immortals" - the personal guard of Xerxes. The Persians surrounded the squad, Leonid and destroyed it in an unequal battle. Neither Spartan not surrendered - were killed every one. Subsequently, in honor of the fallen at Thermopylae the Spartans on the stone was knocked out the inscription: "A traveler knows, Bring all the citizens of Lacedaemon: honestly fulfilled the law, here we lie in the grave." On the hoplite bronze Corinthian helmet with a crest at the highest bracket. Carapace in transition from the "Bell" to "anatomy." On the feet bronze greaves. Heaton traditional red color with black and white pattern. Buckler-goplon covered with bronze leaf and adorned with the emblem of its owner - a scorpion. Of the weapons: spear with shaft made of ash and short sword.